At The da Vinci School, we recognize that learning begins from (before) the moment of birth. 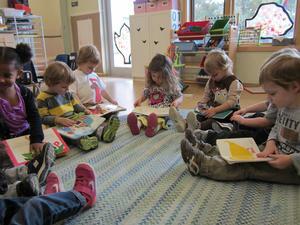 There are many important developmental milestones that take place before our young students ever walk in our doors. Since we believe that parents are the child’s first and most important teachers, it only makes sense that parents need to be informed about the development of their child beginning at birth. We consider education of the parents to be an integral part of the school. There are several formally and informally organized parent education events throughout the school year; most are open to the community. Topics for parent education seminars range from child safety and health issues, to positive discipline, sibling rivalry and how to stimulate learning in the home environment. We strive to address a range of needs. Below you will find some interesting articles to get you started.